The plants go around the entire shed. I certainly didn't plant them so they must have come back from something last year. The thing is, there still aren't any zucchini growing on it. Tons of blossoms but no fruit yet. Is that weird? Anyone out there have any idea how it happened? Anyway, I figured if it was going to continue giving me all these blossoms, I'd make use of them! 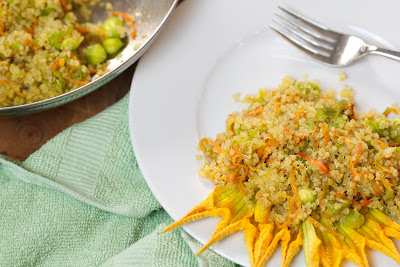 Last year I stuffed and fried them which was amazing but I was feeling a little on the healthier side at the moment and so I went with this stir-fry with quinoa. I used coconut oil to saute the onions and shallot and then cooked down the chopped blossoms. 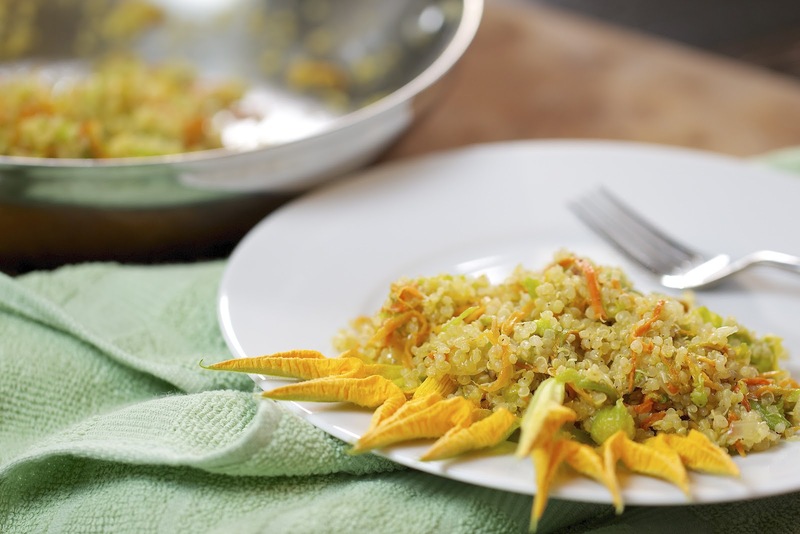 Add some spices and other veggies along with some cooked quinoa and you've got yourself a quick and healthy side dish. You could really play around with what you add to it. I had some lemongrass paste in the fridge too so I put a bit of that in too but it's all up to you. It's late in the summer but you may be able to still pick up some blossoms at a local market, or just swing by our place. There were a whole bunch still out there. The Virtual Potluck team is also working with Anolon this week and so I got to make this stir-fry in a beautiful new copper stainless steel pan. I've been wanting to try stainless steel cookware for awhile now so I was pretty excited to try it out. It's stainless steel but it has a beautiful copper bottom which helps it conduct heat and can even work with induction cook tops. I used the 9.5 inch "Everything Pan", and it really does work for everything! I've made eggs, sauces and sauteed meat in it as well as this stir-fry. One of my favorite parts of it is that it also has a lid that actually fits on it so well compared to my other pans. Love it. Check out Anolon for all their other pots and pans too. Heat the coconut oil over medium heat in a large saute pan. 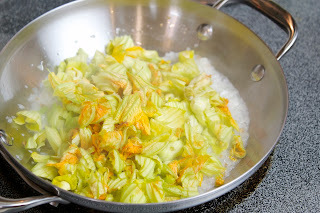 Add the shallots, garlic and squash blossoms and carrot and cook until softened, 3-5 minutes. Add the lemongrass paste, quinoa and cumin and continue to cook for an additional 2-3 minutes. Season to taste with salt and pepper. *Disclosure. 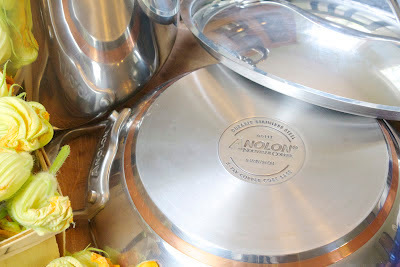 I received two pans from Anolon but was not otherwise compensated. All opinions are my own. Looks beautiful and sounds delicious! I'm always looking for new quinoa recipes. 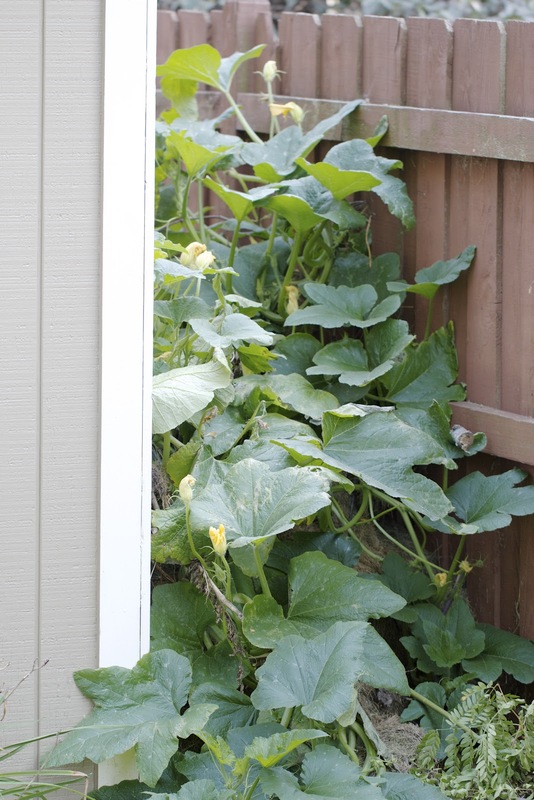 We had squash plants show up unexpectedly at our community garden near our compost bins. This is gorgeous and I love quinoa. Yum! 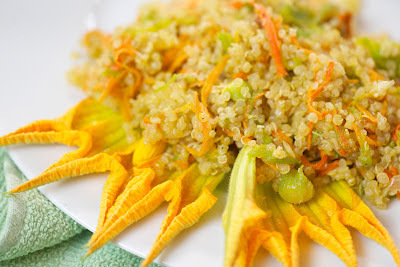 Squash blossoms are the best, this looks amazing - love the lemongrass and cumin here! 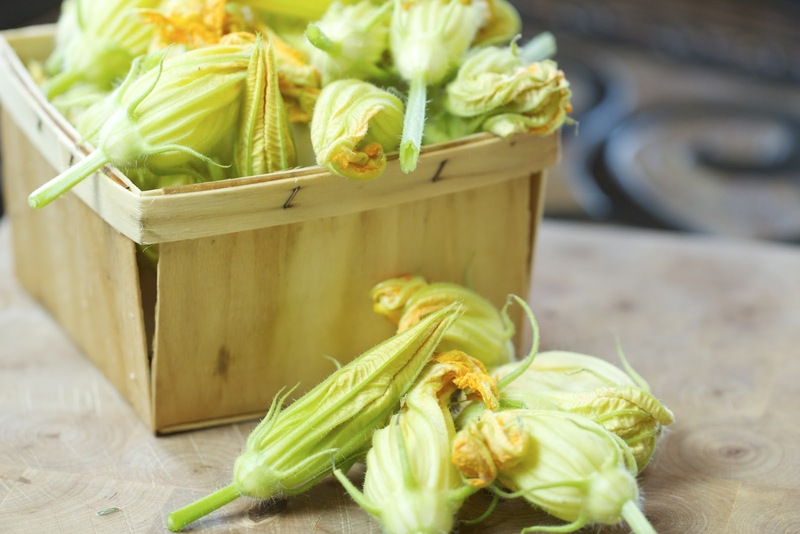 The presentation with those squash blossoms is just beautiful. I love how you can incorporate the food into the decoration! I've never tried squash blossoms, this looks so good and I love these pans! Love this Matt. I have a pumpkin vine that is taking over my yard (currently 25' in circumference) and I have been wanting to raid the blossoms...thanks for inspiring me to get out there and harvest some deliciousness. Great recipe. 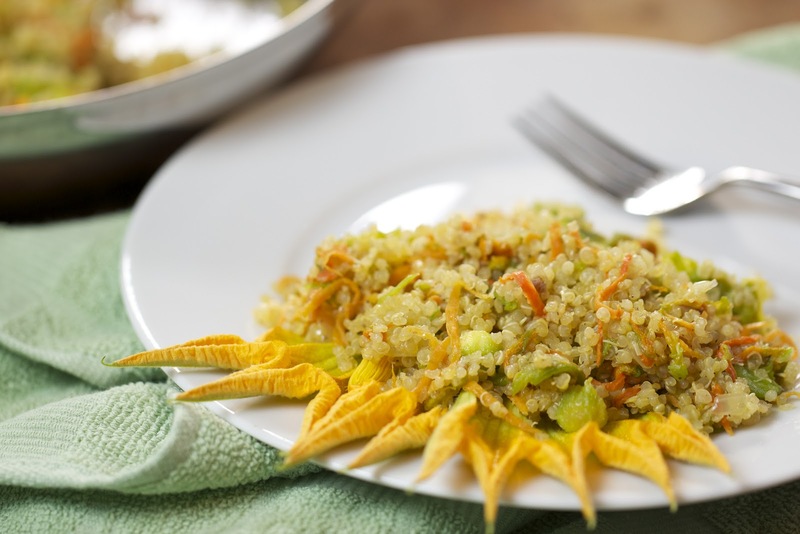 I love coming across new ideas using quinoa. This looks very good--beautiful with the blossoms. I grew zucchini this year mostly for the blossoms. Strangely mine produced no zucchinis either, even though I left it alone for a while. The plants need both male and female blossoms to make zucchini. If a plant is a rogue, it could have evolved from a single blossom that had not yet been fertilized, resulting in a single cell plant that will never produce fruit. I've had it happen a lot in my garden, as I compost everything right in to the soil and sometimes get some really strange looking plants that just never do anything but take up room. Good thought to use all those gorgeous blossoms, though. This recipe is really great! I love the colors in your dish and love that this dish is super healthy! This is perfect to my kids because they need to eat healthy food like this. Please keep on sharing! Thanks!